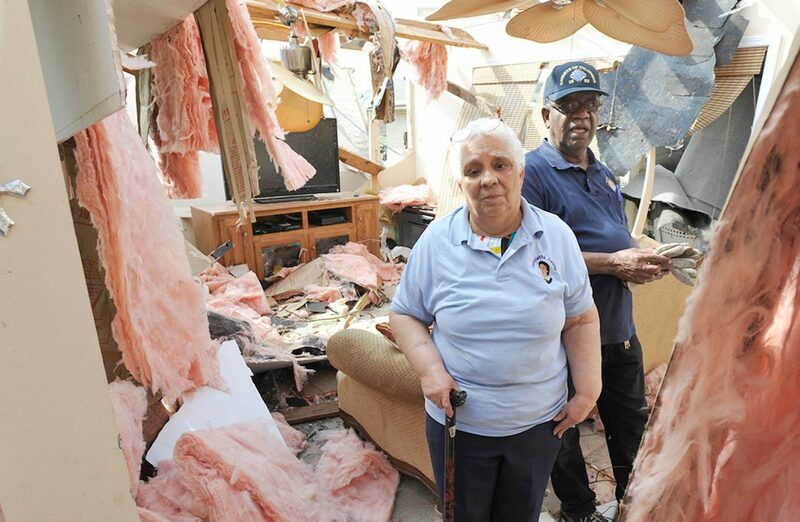 NEW ORLEANS (CNS) — Vergie and Roger Davis of Resurrection of Our Lord Parish in New Orleans East, who recently celebrated their 50th wedding anniversary, have been through natural disasters of near biblical proportions before. In 1982, an electrical fire broke out inside their three-bedroom home five blocks from the church, sending smoke billowing through the interior. The cleanup took 18 months. In 2005, when Hurricane Katrina breached poorly constructed federal levees, their house, for which they had just made their last mortgage payment, took on 4 and a half feet of water. They got back into their house in 2007. And, then Feb. 7, a massive tornado swept through the neighborhood while Vergie took cover inside an interior closet. After about a minute, when the noise stopped, she was able to pry open the door despite the debris pile at the bottom of the door. She looked up and saw the sky. Their house had been destroyed. The Davises were among 250 families in New Orleans East whose houses were either heavily damaged or destroyed by the powerful tornado, relatively rare in southeast Louisiana. Despite the wide swath of damage, officials reported no fatalities and only about a dozen injuries. As the Davises assessed the damage Feb. 8 with their pastor, Father Geoffrey Omondi Muga, of the Franciscan Missionaries of Hope, they reflected on the trials they have endured over the past 35 years. Father Muga, pastor for 14 months, walked through the neighborhood to assess the devastation. He stopped at the heavily damaged brick home of parishioner Carol Adams, who told him the doorbell had rung mysteriously before the tornado hit. Catholic Charities Archdiocese of New Orleans was among several agencies partnering with the Red Cross and city officials to establish an overnight shelter at a facility in a nearby park and offer case management and counseling services. Second Harvest Food Bank of Greater New Orleans and Acadiana, operated by the archdiocese, dropped off 700 prepared meals and set up distribution of water and snacks at the park. It was considering setting up a distribution site closer to the damage zone. “We’re still trying to get a handle on it,” said Jay Vise, director of communications for Second Harvest. “Every time I see more footage of it, it just seems bigger and bigger. Meteorologists tell us they’ve never seen this type of tornado. This is a Midwest, giant wedge tornado. You don’t see that down here. As the Davises walked over felled beams, ribbons of pink insulation and shattered glass in their living room, they said they were not sure what they would do next. They do have insurance, but they may not want to rebuild a third time. The couple said they’ll have to make a decision about coming back and rebuilding — the house will have to be torn down — or finding a house or condo in another part of the city. The Davises said they will continue to hold fast to their faith. Vergie is continuing to recover from an aneurysm last summer, and their daughter had a recent battle with cancer. Vergie wore a light blue shirt with a patch honoring Mother Henriette Delille, foundress of the Sisters of the Holy Family, a congregation of African-American sisters founded in pre-Civil War New Orleans who educated slaves and cared for the elderly at a time when teaching slaves was against the law. Roger wore his Knights of Columbus cap and shirt. Vergie got her name because she was born March 24, the eve of the feast of the Annunciation of the Mary. “Ask God to guide me as to which way to go,” Vergie said. Before leaving their home, Father Muga joined hands with the Davises and offered a prayer. “Almighty Father, we thank you for life,” he said. “We thank you for the gifts that you’ve given us to be your sons and daughter. … We lift Vergie and Roger up to you today and thank you for their lives, for sparing them.